This entry was posted in Mental Health and tagged Managing Symptoms, Overcoming Fear, Recovery, Treatment on September 21, 2016 by Team Addiction Hope. Anxiety disorders are the most common type of mental illness in the United States. They affect more than 40 million adults across the nation. Children and teens suffer from these disorders, too, although it’s hard to determine the exact number. Whether due to fast-paced lifestyles or higher levels of stress, anxiety disorders have sharply increased in the last few decades. Luckily, most cases of anxiety are treatable. Patients tend to respond well to therapy and even medication. For those looking to control their anxiety without medication, meditation is a centuries-old remedy for a worried mind. Either in conjunction with other forms of treatment or as a complete solution, meditation may offer relief from several anxiety disorders. Worry and anxiety are mechanisms in human brains designed to keep us safe from predators. As our society has evolved, the part of the brain concerned with events such as a lion attack or ensuring crops are planted is still active. However, our worries are now less about self-preservation and instead about getting the kids to school on time or making sure our work presentation shines. Though not life or death situations, those worries are still just as real. Most of us have perspective about these concerns, but for some, these worries can stem from an anxiety disorder. Learn more about the causes and symptoms of anxiety here. Mindful meditation can be an extremely effective method for people struggling with anxiety. No extensive training is required, and the practice focuses on sorting out one’s thoughts and physical sensations, making it precisely the avenue of relief that someone under excessive stress needs. Meditation takes daily practice, but once someone has begun to do so, it can be a tool in his or her arsenal against anxious thoughts, offering some clarity and distance from whatever fuels the anxiety. Choose a place with little distraction. It should be somewhere that feels peaceful, and ideally is filled with only natural light. Sitting outside works well, so long as the area isn’t too noisy or busy. There are many different recommendations for how to sit while meditating, so it’s important to find one that is comfortable. Some experts will recommend crossed legs and straight spines, while others argue that having a relaxed back and feet on the floor is the best choice. See what works for you. Focus heavily on the feeling of air entering and exiting your lungs. Notice the swelling within your chest as each breath changes its shape. Ground yourself in the physical sensations, and allow your mind to turn off the buzz for a while. When thoughts do come, acknowledge them, but don’t dwell on them. Wipe them from your mind as if cleaning a table top. The type and severity of the symptoms vary, but since the mind controls the physical body, these symptoms can take a toll. Adrenaline is produced in excess and dumped into the blood stream during an intense episode of anxiety, triggering the above physical symptoms. The increased level of adrenaline is taxing on the body, particularly on the heart and lungs. When those with anxiety disorders practice meditation, it slows their heart rates, calming the mind. Once the mind has settled and the negative thoughts are put away for a while, adrenaline production slows down. When the body stops responding negatively, the mind also relaxes. Meditation is so effective because it stops the cycle of anxiety driving physical symptoms, which lead to panic and heightened anxiety. While allaying the physical manifestations of anxiety, mediation lets your brain create new paths for thoughts – replacing negative thoughts with new, more positive ones. 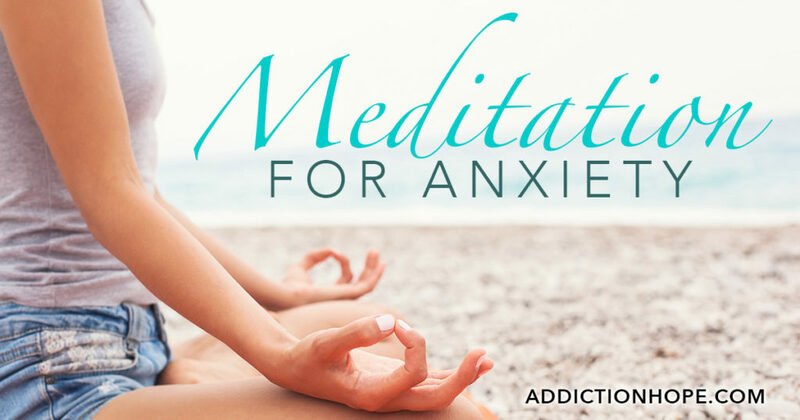 Meditation for anxiety can be a cure for those suffering from milder disorders. For people with more serious conditions – such as panic attacks, cutting or other self-harm – mediation becomes just one tool out of many that can help control overwhelming symptoms of fear and worry. There are several variations of meditation, so it’s not a one-size-fits-all practice. Some people even practice guided mediation in group settings. Regardless of the place or situation, calming the mind through meditation is a great first step for controlling the many symptoms of anxiety.